The Royal Naval College was built on the site of the Greenwich Palace by Christopher Wren in 1694, when it was called the Greenwich Royal Hospital for Seamen for the relief and support of seamen and their dependents. The Royal Naval College was built on the site of the Greenwich Palace by Christopher Wren in 1694, when it was called the Greenwich Royal Hospital for Seamen for the relief and support of seamen and their dependents. 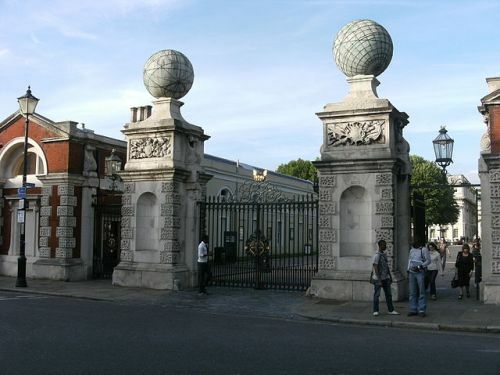 It became the Royal Naval College in 1873, and recently the University of Greenwich and Trinity College of Music have moved in. The twin-domed English Baroque buildings are a World Heritage Site today, best known for the chapel and Painted Hall with elaborate ceiling and wall paintings executed by Sir James Thornhill between 1707 and 1726.